Analyze and calculate a registered data and assigned mounting category then create mount drawings (mount drawing and work drawing of post-mounting). Search component name, reference and mounting position on the board mutually. Set the mounting category for each component name and reference with checkbox. 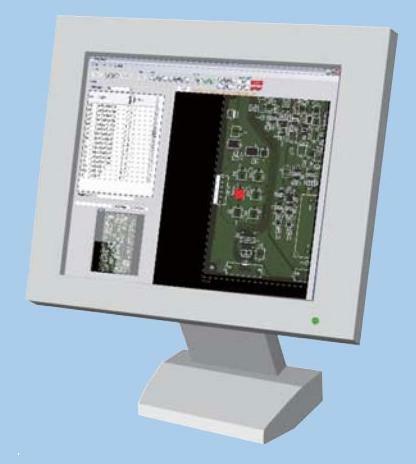 Display the list of mounting component in charge and its mounting position on worker's PC. The outline of the component is automatically drawn with the color set for each mount category in the drawing. The worker name or work procedure can be set for post-mounting component. If setting mount category at creating component list, the mount category can be set collectively at loading component list. The worker just does mounting work according to the indication of display, so that it can be removed to forget mounting or mistake the position. 1 Search Search component name, reference or mounting position of component mutually. 2 Create mount drawing Create a drawing which displays component outline with the color specified for each mounting category. One mount drawing can display for one mounting category or several ones. 3 Create work drawing of post-mounting Create a drawing which displays component outline specified as post-mounting category. Display component name, reference, entry comment and so on in the drawing. 4 Navigation of post-mounting work Display mounting position of the component (reference) in turn according to the advanced setting on PC. Entry of check mark which indicates the completion of work for each component (each reference) is available. 5 Create necessary document, Edit Z-axis Create list of coordinate or component for mounter. Edition of Z-axis is available. Kaizen Master needs the following data to analysis and process. Setting mount category is also available. 3 Silkscreen data Gerber data of silkscreen. 1 Wizard of data registration Data registration wizard by which component list and coordinate data of various format can easily be registered can be utilized to operate according to the indication on the display. 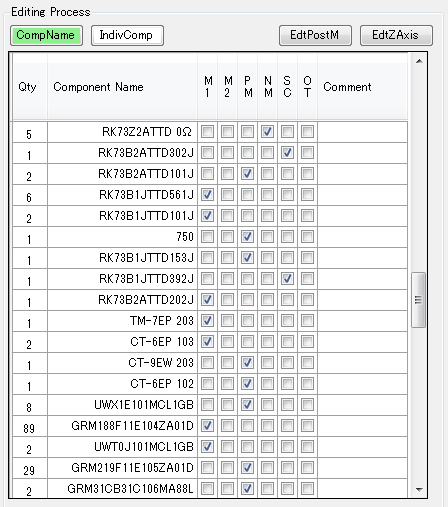 2 Standard format Registration of component list or coordinate data which has been edited as standard format of Kaizen Master is also available without the wizard. 1 Setting with checkbox Set mounting category for each component name or reference with checkbox in the list of process edit which is create by loaded component list. 3 Classify mount category Set to five mounting category in advance. The strings which indicates mounting category can be assigned optionally. 1 Edition for post-mounting Edition of post-mounting is available for the component set as post-mounting. 2 Setting work procedure of post-mounting components Work procedure can be set regarding the component set as post-mounting category. The work procedure is reflected to the navigation of post-mounting work. 1 Display mount category Display a board drawing reflected setting of mount category in the area of basic board drawing display. 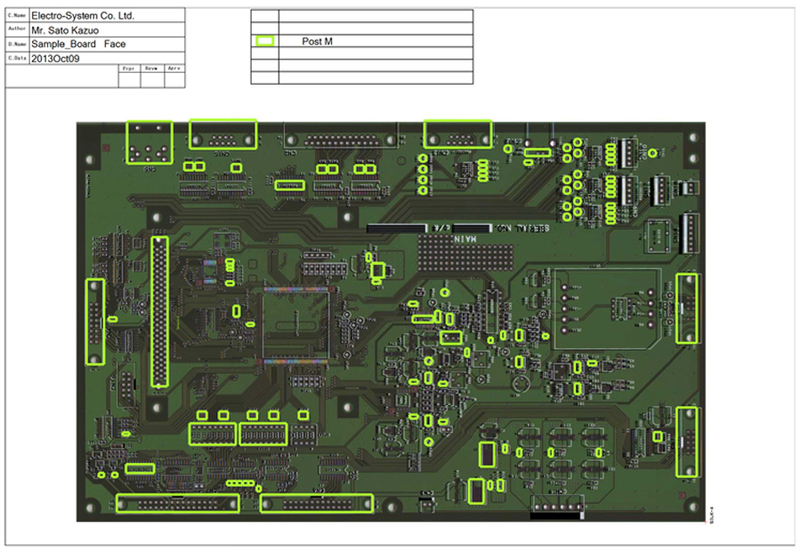 The board drawing is created by analyzing and processing the setting of component list, coordinate data, silkscreen data and mount category which have been registered. 2 View/Hide for each mount category Available to switch between view and hide of the display of component outline set by mount category for each mount category. 3 Setting polarity mark and No.1 pin mark Available to set polarity mark and No.1 pin mark to component with any size and position. Polarity mark and No.1 pin mark are reflected and shown in the mount drawing or the drawing of post-mounting work. 4 Setting comment Set comment to the component. The comment is reflected in the mount drawing or the drawing of post-mounting work. 5 Zoom in/out board drawing, Move the view position Available for the board drawing to be scaled up & down or moved for its view. 1 List of process edit The list of process edit is created based on a component list and is used for setting mounting category. Also used for specifying component name or reference at searching. 2 Switch the display between each component name and each reference. Available to switch the display of mounting category between each component name and each reference in the list of process edit. Different mounting category can be set to the multi-mounting component for each reference by setting mount category in the display of each reference. 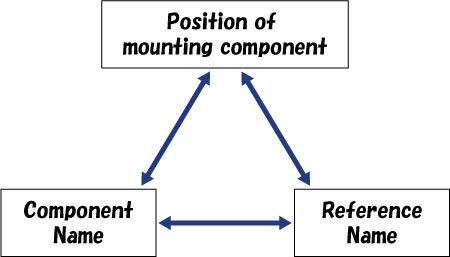 1 Search mounting position from the information of component name and reference. 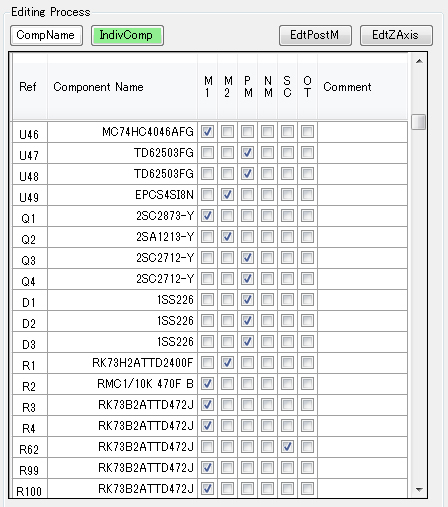 Search a mounting position of corresponding component by component name or reference name in the list of process edit. Display the result of mounting position highlighted on the board picture. 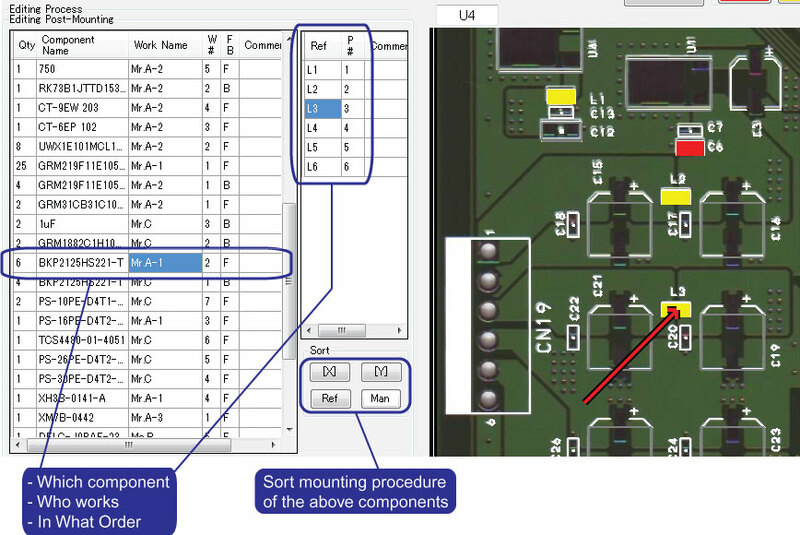 In case of searching multiple mounting component by component name, all mounting position are highlighted at the same time. 2 Search component name and reference from the information of mounting position. 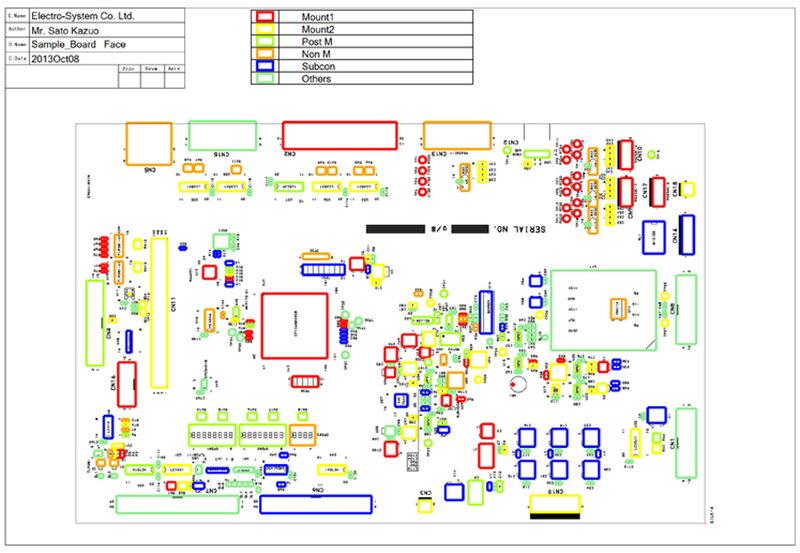 Search a component name or reference name by the mounting position on the board drawing. 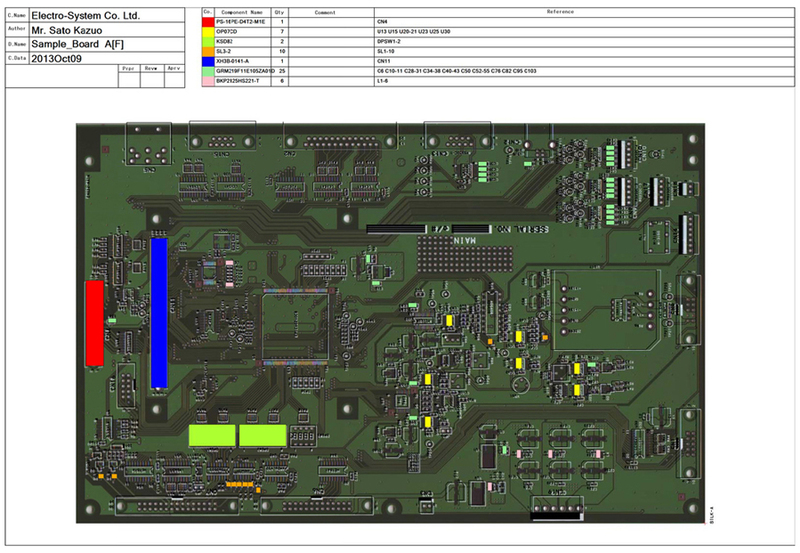 Click the component outline on the board drawing to specify the mounting position. The result of searching is highlighted on the list of process edit. 3 Search component name and mounting position from the information of reference (text string). 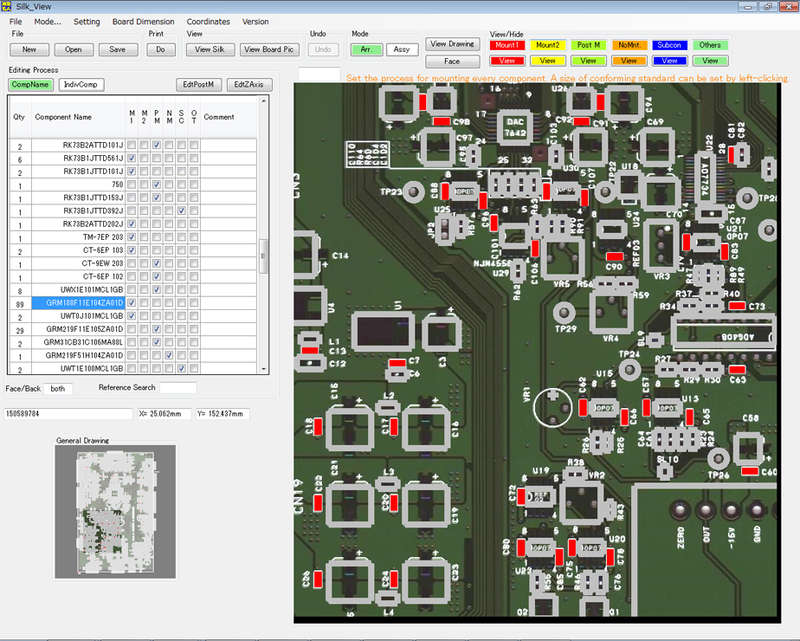 Component name in the list of process edit and mounting position on the board drawing are highlighted by entering reference in the reference search box. 2 Adjust outline of component manually Create and adjust a component's outline manually in case of incorrect extracted. Available to adjust all the same component collectively. Also available to register the result of manual adjustment to library bound with component name. 3 Adjust width or color Set and adjust width, color or painted-out of the line of component's outline. 1 Mount drawing Print out a mount drawing. Also available to export data as picture file. 2 Create work drawing of post-mounting Print out a work drawing of post-mounting. Also available to export data as picture file. 1 Adjust position gap of board picture Adjust a size error of scanned board picture manually. 2 Adjust position gap of silkscreen Adjust a gap between the coordinate origin set to silkscreen and the one of component.